There is a company making tail skins to fit the mahina. Swimtails? I think. They look nice! Made out of neoprene. Oooo that looks really nice!! Omg, thanks for answering with that great link! It helps me out! I’m about to buy 2 new colors... but I hate returning things. It sounds like it fits, with a little struggle, but it will fit!! Ordering now! 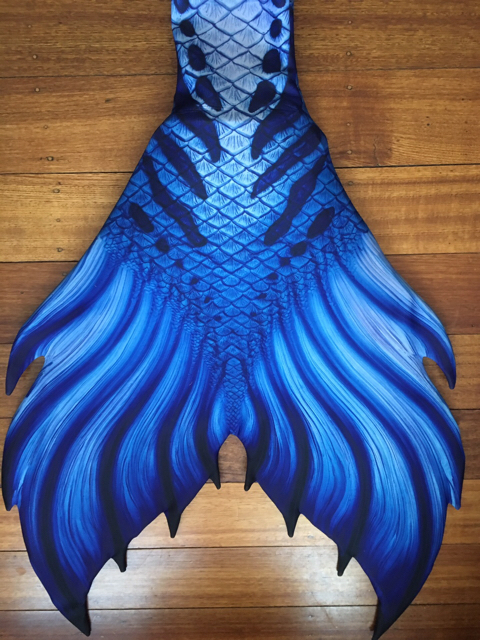 i just got my new luna adult monofin in today, took it for a spin in my adult finfun dragonfly skin (fits finfun pro and suntails nunui monofins) tail skin, it fits, there is a little stretch in the middle of the fluke as the skin was not cut to be so wide half way down, but the fabric relaxes in the water and there is no damage from the one time use. 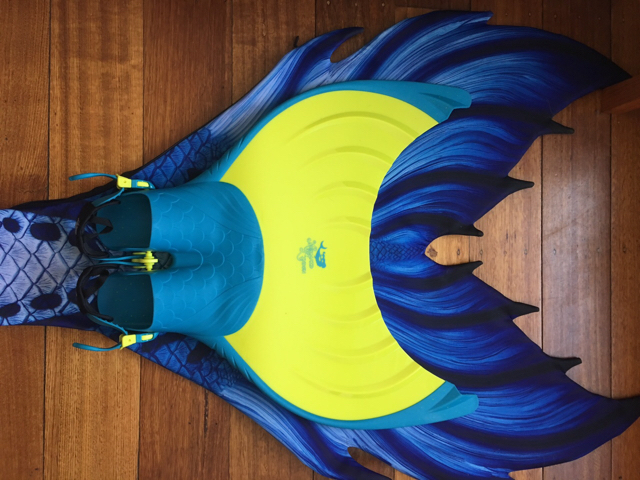 the bottom of the monofin peeks out about an inch, changing the profile from the sleek fluke to the ribbed wave pattern, but as long as you have a tail that matches the monofin's color scheme it doesn't look bad at all. the heel profile is much more slimmed down from the finfun pro/ suntail heel, the only thing that might stick out as odd in pictures are the ankle buttons for the straps. i don't find myself bothered by it if you take the time to tuck the straps right, it blends the silhouette pretty nicely. i will continue to wear the luna with the dragonfly to see if any inherit problems arise. 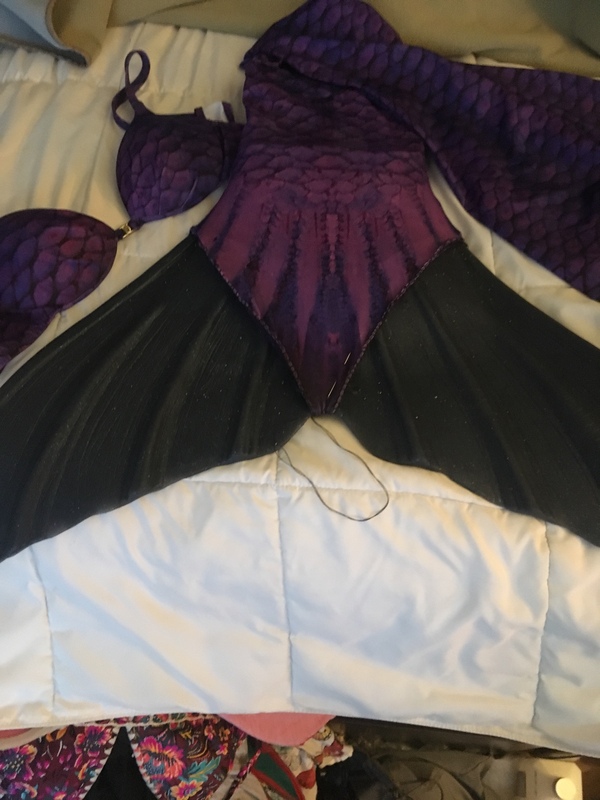 I just finished stitching up my old Mertailor Ecotail to fit the newer Fantasea Fin! This used to cover the EcoTail fluke (don’t remember what they recommended pairing it with). 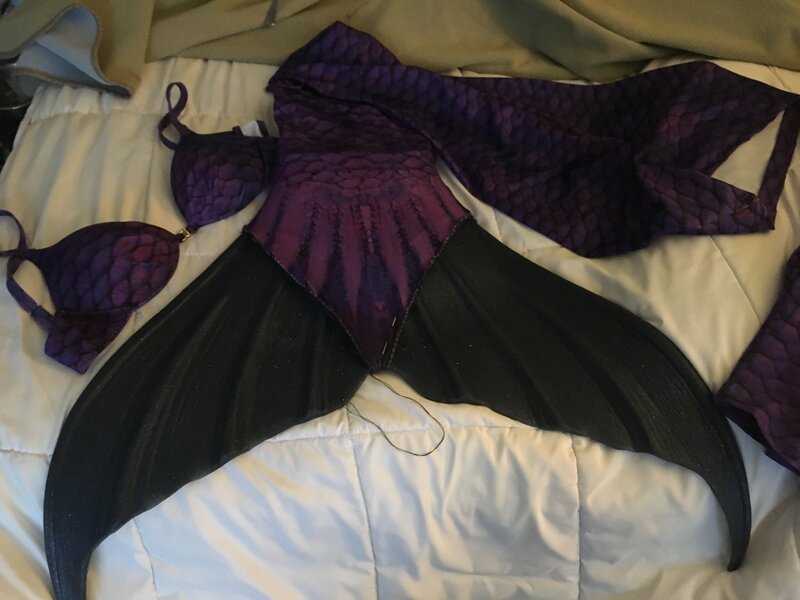 It would normally cover the whole fluke- I had to alter it to look like ones that end in a ‘V’ shape- there was not enough fabric to cover the Fantasea Fin fluke. It still turned out really well. I also took a video how I did it- if anyone needs to see it. I was totally winging it, I craft a lot, I am not a professional seamstress. If I share the video, it would be a ‘do this at your own risk’ type situation, I cannot guarantee that what I was able to do, will always work. I just got to the point that wearing an open, floppy fabric tail wasn’t as satisfying as MAYBE I could get it to look like. I love love love this idea! I have a bunch of tail skins but no good monofin to use with them. This is fantastic! Does anyone know if the Adult Linden monofin will fit the finfolk fabric tails? The linden adult monofin fits the FinFolk fabrics! Will the adult mermaid linden fit in an adult FinFun tailskin? None that that I know of personally. Whoops I didn't mean Finfolk (I say that because I saw a vid where someone was able to get it in there and use it). Mermaids Inc is the other I think. It's been a long time since anyone talked in this thread but I figured it would be a good place to ask. Is the newer adult Linden Monofin compatible with a suntails skin?